Principles – Dortmunder helfen in Kooperation e.V. We haven’t yet forgotten the pictures from Kurdistan of spring 1991, even though the media interest has long died down. Moved by these pictures and reports in the media, some of the people from our city have started to show their solidarity with the Kurds in Iraq. From this a citizens’ action group was born which has also wide public support in Dortmund. A particularity of this is the fact that we have tried from the outset to appeal to a wide public. We have achieved this above all by bringing together representatives of many levels of society. The representatives of the two churches (catholic and protestant), science, culture, administration, the medical profession and politics have issued a joint appeal. Because of this, a lot of people could follow this appeal, probably impressed by celebrities, and support our work. We prepared our work by a trip of delegates to the scene of action. Only then we started with the actual work. Our first two delegations quickly noticed that the destruction of Kurdistan was far greater than previously known. It was like a complete shock! Destroyed villages everywhere, as if they had been in ruins for thousands of years. This was the doing of the Iraqi nationalistic state and with the destruction of 4500 of a total of 5000 villages the deed was almost complete. The Anfal campaign started in 1983 and the use of chemical weapons in Halabdca in 1988 were two highlights of this work of destruction. This destruction has virtually extinguished the Kurdish farming community. Hundreds of thousands were brutally murdered, above all men. Therefore, there is a vast number of widows and their families. This is a particularly grave problem. The destruction of the villages has robbed the people of the most important thing in their lives: their work. Whole village communities have been put up in so-called model villages where there was no work and the people were degraded to unwillingly idle receivers of handouts, as monthly food rations were given out. One has to consider that this was only possible because of petrodollars. Without this oil money neither Saddam nor any other dictator would have been able to afford to destroy 4000 villages and with that wipe out a very important agricultural food source for the whole population in Iraq. Us Europeans have contributed to this by our enormous consumption of oil. We believed that the home-comers were the ones which had fled last spring. That’s wrong! The term home-comers talks about those villagers which had been expelled in the years before the gulf war. And the families of widows are those families whose men went missing or were murdered because of the expulsion actions. This had also been unknown to us. Therefore when we started our work there, we were dealing with completely destitute people. Even the city dwellers were destitute, because they had lost almost everything during the tide of refuge. When they returned to their places of residence later on, they found the houses completely looted and public buildings and infrastructure destroyed. The autumn of 1991 was a very difficult time for millions of people in this region. To begin with we started in the valley of Barzan. This valley is situated around 40 km to the east of the historic town Amadiya, along the river Great Zab. The valley is very fertile and very suitable for small livestock husbandry. However, it has been – after the deportation of all its inhabitants by the regime of Saddam – completely uninhabited for 15 years. All villages had been razed to the ground, the water springs destroyed, the domestic animals seized, the woods and cultivated plants burnt down. As a consequence the valley had become completely overgrown, cultivated plants were destroyed and the arable land has to be re-cultivated again. 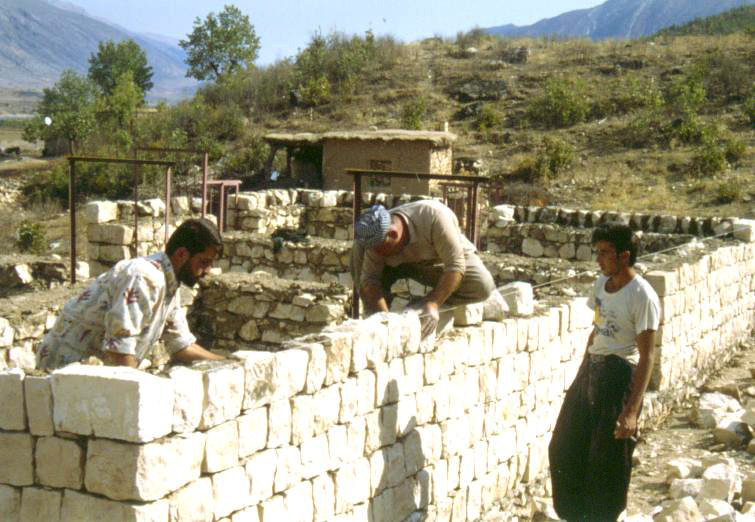 Until our efforts in the autumn of 1991 there were hardly any domestic animals in the valley of Barzan! The people in the valley of Barzan belong to the tribe of Barzan which was also the tribe to which the legendary leader of the Kurds M. Mostafa Barzani belonged. In order to set an example against this symbol of the Kurdish uprising in Iraq, the Iraqi government took particularly cruel action in this area and had thousands of members of the tribe murdered. The people from this region were scattered in all directions. Many of them lived for several years in Turkish Kurdistan or Iranian Kurdistan in refugee camps in the worst conditions. Others were forcefully settled in so-called model villages (deportation camps of Saddam until the end of the gulf war). In particular, the people from the Barzan region were taken away to the deportation camp Kotschtepe, which was also named widow camp because of the number of widow families. After the gulf war of 1991 many deportees returned and started to rebuild their villages. Another operational area of the DhK is Nahle, a Christian-Assyric region with 7 villages. Nahle is located in the south-east of Amadiya and is a very fertile valley. These villages were also completely destroyed in 1987 and the inhabitants were deported. The villages in Nahle were partly rebuilt after the Kuwait war as well. The reconstruction continues. The DhK has given aid for agriculture and cattle farming in Nahle. This work was done helped by the co-operation with the GfbV South Tyrol, i.e. the money for the projects came from South Tyrol. The principle of “helping people to help themselves” has been our fundamental guideline. The people who returned to their completely destroyed villages didn’t have any means to create a new life for themselves. In this situation alongside emergency aid there was an urgent need of start-up aid for the restoration of village life. Therefore we had come to the decision that our aid had to be pinpointed to agriculture and animal farming. For that reason aid for infrastructure renewal was to be given which should make it possible to live, at least temporarily, autonomously. The particularly difficult situation of widow families played an important role in our work. In some cases the male family members have been missing for nearly 20 years since Iraqi soldiers deported 8000 men and boys from the camp of Kotschtepe in August 1983. Apart from the now missing male work capacity, the offspring of these families and the widows unfortunately don’t have sufficient knowledge with regard to agriculture, either. Therefore, we always made sure that the widow families were the first ones to receive our aid. The participation of all villagers in all our moves was always a prerequisite. For example, when we handed out seeds, got the necessary equipment and paid the rent for tractors, the farmers carried out the rest of the work themselves. An exception was however made for the widow families who we provided with the labour as well, as far as necessary. When distributing seeds and animals we went by the number of persons in each family. Furthermore, for the distribution of sheep we took the number of babies or children into account, as their supply with milk is particularly important. We attached particular importance to villagers being informed from the outset on the content as well as the planned extent of our aid. This assisted us in incorporating the people affected into our work. During our efforts we relied above all on human labour. For instance, we didn’t use any machines apart from tractors during the work on the ducts for the irrigation project in Balinda. On the one hand there are not enough machines anyway and on the other hand when using machines the work is often unbearably long delayed because of the lack of spares. Another important point is the consideration of the particularities of the way of life during the building activities. For thousands of years clay bricks have proven themselves as particularly favourable building material. Clay brick is an excellent insulation material. This is even more important when considering that heating fuel is particularly scarce. Moreover and no less important is the importance of animal farming, i.e. dairy farming. In the heat of the summer months milk has to be stored in a cool place, otherwise it will go off quickly and therefore become unusable. The construction with clay bricks makes this possible. Furthermore it is easier to be heated in the winter months. Many organisations, above all the UN, built houses only with concrete. The abject poverty and time pressure favoured this. Unfortunately this has contributed to the fact that the already low stock of trees was further damaged by the increased consumption of heating fuel. The use of concrete by other organisations has made our work considerably more difficult. The families wanted to “build more modern” and demanded concrete. Nevertheless, we could avoid the use of concrete to a large extent in the Welati Jeri region. An important point at the end: The relevant local authorities were informed about our plans in advance. We have also constantly co-operated with other NGOs and informed each other, even thought this was problematic at times. So far two villages, Balinda and Soreywan, have been completely rebuilt with our help. Today approximately 60 families live in each of the two villages. There are several families from Soreywan who still live in Iran. These families would return if there was aid available to them as well. Furthermore, we have assisted the reconstruction of eight villages in the area Welati Jeri. The returnees have so far built their houses themselves. This year we financed the building of 50 houses. These houses will be completed at the end of October. The main emphasis of our help is the rehabilitation of agriculture and animal farming. So far we have given aid in this field in approximately 34 villages. This aid consisted of seeds of various types of cereals, fruit tree seedlings, livestock, such as hens, sheep, goats, donkeys, mules, horses and oxen. In areas where no streets exist, the mules are indispensable. Oxen are also necessary in these areas as there is no other possibility to cultivate the land. Animals such as sheep and goats are a very suitable help especially for the widow families. It is very difficult for the widows to operate agriculture. However, it is easier to keep animals, as they are much more familiar with this kind of work. The recreation of the villages is an extremely complicated process. The structures which have been created over hundreds, even thousands of years have been completely destroyed. It is not easy to completely recreate these living institutions within a short amount of time. Nevertheless, the bare essentials need to be done for the villages to be able to develop further. A small sign which can show the farmers a way to the future is indispensable. Therefore, we try to give a certain aid for infrastructure renewal wherever we can. Above all this consists of irrigation plants, water mills, bridges and the pay of the labourers for the widow families. Today the villages which receive our help are capable of providing for themselves to a large extent. This is thanks to our ongoing provision of aid. But we have to realise that all of this is hanging on a very thin thread. The life in the villages has many advantages, but the fascination of the cities is very powerful. At this point I would have liked to voice some of my thoughts on this. Time didn’t permit this, as I have only recently returned from Kurdistan. Apart from the very difficult situation in Kurdistan at the present time, it won’t be easy for the villages in the future, either. The population growth is one of the problems. The poverty normally spreads itself first in the rural areas. If these problems aren’t avoided, there will be no long term future for the life in the villages!